My husband and I have always had to watch our money our whole married lives, and try to be as frugal as possible. When we had children at home, I had to get as creative as possible, at times, in order to feed and clothe everyone well. I grew up in a household where I did not learn about frugality at all, so I was literally thrown into it! I did lots of things to try to save money and one of those things I did, and still try to do, is to take advantage of whatever free food I could come up with. I am a firm believer in freezing and canning in the spring and summer months. It helps considerably on the grocery bill during the cold winter months. I have never had a problem with going somewhere and doing the work in order to gather food for our family. We have friends that have a large garden each year and they always share what they have with us. We have two large dogs that dominate our back yard so I don't have a lot of room for a garden. So when these people, as well as others call, I go running. I do always put out tomato plants and we share those with others as well. 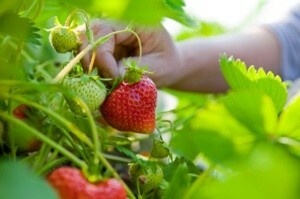 This year I am going to try my hand at strawberries and will share our yield with friends. I can remember going and picking raspberries out of ditches and filling buckets with them. We live in sweet corn country and I have gone and picked sweet corn from friends' fields. There is nothing like good old corn on the cob in the summer time! Another thing we would do is to have clothes swaps. I had lots of friends with whom I would get together for the afternoon and while the kids played, we swapped clothing. I spent very little money on my kids for clothing as they grew. Kids grow so fast and it only makes sense to share, one with another. You don't have to just share kids clothes. Sharing adult clothing is always fun, too. You can clean out your closets while you are cleaning out your children's closets. Not only are you sharing and saving yourselves money, but you are having an enjoyable afternoon together with friends. Something else I would suggest doing for both enjoyment and money savings would be to spend a day cooking with a friend. Cook some freezer meals and then divide up what you have made so that each can take some home. Shop together for the ingredients and then spend a pleasant day working together to prepare the food for your families. Even if you cannot do this with another person, I still recommend making some freezer meals for those times when you are in a hurry or sick. This way you won't be so tempted to go and spend the money for an expensive take-out or fast food meal. Crock pot cooking is great! Even the cheapest, toughest meats come out of the crock pot literally falling apart! I have learned to love my crock pot even more now that it is just myself and my husband at home. There's a wealth of crock pot recipes on the internet so dig around a little bit. It will be worth your time. I do use coupons when I can find one that is a really good deal, but anymore, coupons don't seem to be as great as they used to. With generic prices, often I can get the generic at regular price cheaper than the name brand with a coupon. Also, we have no stores around here that double or triple coupons. If you live in an area that does, I recommend you take advantage of it. When we lived near a day old bread store, I shopped there weekly. You can find some very good deals on many different items. Now we live where we have an Amish store within driving distance. There are many scratch and dent items there that can be bought for a fraction of the regular grocery store price. However, I do not recommend buying badly dented cans as they are not safe for your health. Also, in these types of stores, I have learned how important it is to read expiration dates. It takes some digging, but it is worth the time. A neighboring Amish store has bulk spices and grocery items as well as wonderful produce that is usually considerably cheaper than the regular store prices. Today, saving money is not easy. It takes time and effort, but it is so worth it! Be sure to take your kids along and make some special memories while you are at it. Be teaching them about frugality at an early age. I can promise you, it will be much easier on them to learn young than it was on me to have to learn older. Editor's Note: Here is a link to ThriftyFun's Crockpot Recipes, many of which have been submitted by Robin. I also enjoy canning, freezing and making jelly/jam from our garden. There is nothing better on a cold winter day than food from your own garden, preserved by your own hand! Not only does it taste better than store bought, but you get a wonderful feeling of accomplishment knowing that you are providing nutritious food for your family. Plus my little boys love it. Good job! I've always wanted to learn to can and preserve, but my Mom was afraid the pressure cooker would explode and wouldn't let me help; now that she's gone, there's no one to teach me. I think this is the year I get the Blue Book and teach myself! I can attest to the fact that a grocery bill and eating out can be a budget's worst nightmare! One month our entire food bill for that month came out to over $1600! Yes, I said that right. I thought I was being frugal - but far from it! We are cutting that down ASAP now.